Careers At Polyflor Canada Inc. If you are interested in becoming part of Polyflor Canada's future please read on! Polyflor Canada Inc. is the Canadian subsidiary of Polyflor, one of the world’s largest manufacturers of commercial and residential vinyl flooring. 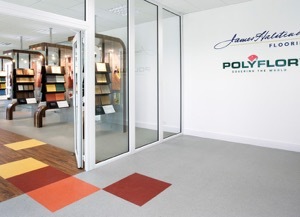 Market leader in the UK and Germany, Polyflor has over 100 years experience manufacturing world class flooring products. Our Canadian head office is located in Mississauga where we supply products for commercial use throughout Canada. Polyflor has a responsibility to its employees, ensuring their health and wellbeing as well as reducing labour turnover, which remains extremely low. In fact, Polyflor has 25 and 40 year clubs for all employees who have been employed by Polyflor for the respective number of years, some of whom have worked for Polyflor for their entire careers, joining straight from school. Retaining an experienced and knowledgeable workforce is extremely important to Polyflor. Polyflor recruits from local and surrounding areas and advertises through local media, job centres, agencies and online. Will you be the next successful member of the Polyflor Canada team? We are proud to offer everything you need to prosper in your chosen career. We invite you to explore current opportunities and take the first step in joining a thriving team. Copyright © 2019 Polyflor Canada Inc.
All Rights Reserved. Design by Treefrog Inc.